With February, Carnival season 2012 comes alive and Tuscany prepares to celebrate with big masked parades and events dedicated to Carnival. Have you already prepared your fancy costume and bought some confetti and streamers? If you answered “Yes”, then you have only to choose the destination to celebrate! Otherwise, do not worry, you still have a few days to find a pretty carnival costume 🙂 . In the coming weeks in Tuscany you will find many fun Carnival events, both in small towns and larger cities. 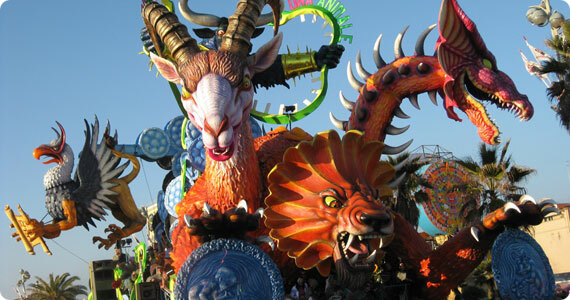 The Carnevale di Viareggio, is without a doubt, one of the most famous masked parades in Italy. Entry tickets: adults €15, free entry for children under 10 years old. Every year along the seaside avenues of Viareggio, visitors are involved in the big event with music, a beautiful parade and lots of fun. The protagonists of this Carnival are certainly the allegorical papier-mache floats, mainly inspired to topical and political facts, competing for the final prize decided by the jury. Here’s a little sample of the Carnival of Viareggio, with a video from a past edition: look at the Carnival video. In Foiano della Chiana (in the province of Arezzo), the oldest Carnival of Italy takes place every year. Fancy costumes, music and a whole series of events will involve visitors in a big party on the 5th, 12th, 19th and 26th of February. Price: regular ticket €8, children under 12 year old have free entry. The masked parades will start at 3 pm. More details (in Italian only), on the official website. In the historical center of Arezzo on February 12th, 19th and 21st the “Carnevale Aretino dell’Orciolaia” will take place with float parades and attractions from all around Italy. More information in Italian are available on the official website of the Arezzo Carnival. The villages in the Mugello, a beautiful area located on north of Florence, offer many nice events during the Carnival period. In the center of Borgo San Lorenzo (Piazza Dante) the appointment is on the 5th, 12th, 19th and 21st of February, from the 2:30 pm. Free entry. Saturday, February 11th will be the turn of the “Carnevalino” around the streets of Vicchio , while on Saturday February 18th, the village of San Piero a Sieve will host the carnival event “San Piero in Maschera” with music and performances from 2 pm onwards. In Florence you can find some of initiatives related to Carnival on the weekends of the 11th-12th and 18th-19th of February during the Chocolate Fair, organized in Piazza della Repubblica, in the historical city center. At the moment there are no clear news about the date of the traditional colorful multiethnic Carnival parade usually organized in the Florence city center but we’ll keep you posted on any news. We wish you an amazing Carnival 2012 in Tuscany!